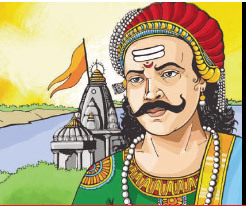 If some one wants to know how India was governed in ancient times and what were the principles on which the governance was based then, one should turn to the two epics, Valmiki's Ramayan and Vyasa's Mahabharat and Kautilya's Arthashastra. These three can be considered as the iconic sources for understanding India's political tradition and basics of governance. In this article attempt will be made to identify the principles of governance in each of these texts as they stand today. Ramayana is a kavya and not a text book on hard statecraft. 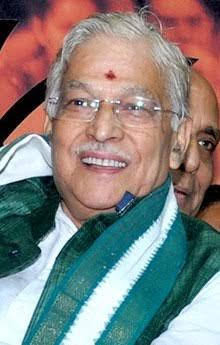 Its aim is to present its hero 'Rama' as an ideal person. 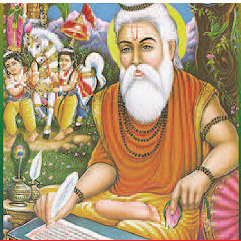 Valmiki, through the conduct and responses of Rama brings to us, how while facing a number of challenges and confusing and complicated situations Rama could successfully tide over them and that too without deviating from the highest principles of Maryada based on Dharma. The Ramayana is not only a very fine specimen of poetic art but also a strong votary of righteousness in a king (state) who should observe sadachar (ideals of good conduct). He should govern according the principles of eternallaw (sanatana-dharma) . The Ramayana is not only a very fine specimen of poetic art but also a strong votary of righteousness in a king (state) who should observe sadachar (ideals of good conduct). He should govern according the principles of eternal-law (sanatana-dharma). The king, according to Valmki, cannot be a despot. We find in Ramayan the king consulting ministers, learned men and the principal officers of the army in shaping the policy of the State. Not only this, but a wider consultation with the people from different parts of land was held. The Ramayana is not Freedom of expressison and participation in frank discussions on important matters related to the state by the people was treated as basic for a righteous governance by the king. 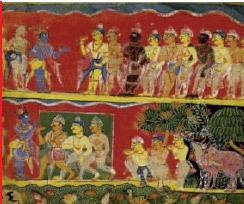 Ramayana indicates that free expression of opinion was invited in such assemblies. 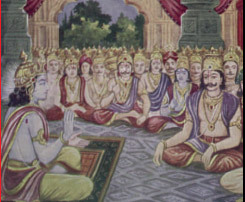 As an example, for finalizing Rama's installation as heirapparent, Dasaratha invited an exceptionally large gathering. Announcing his intention of retiring from administration, he said, 'If what I have proposed is proper' and is to your liking, do you accord approval to it, and advise me as to what else I am to do and in what manner'. He then invited free discussion for obtaining dispassionate decisions. Even when the leaders, and the citizens took counsel together and gave their unanimous support, the king wanted to make them think a second time and so he spoke again as if he had not known their minds. Thus, the freedom of expressison and participation in frank discussions on important matters related to the state by the people was treated as basic for a righteous governance by the king. The main feature of the governance of the descendents of Iksvaku was their commitment to righteousness and devotion to the welfare of their subjects. Under Dasaratha's efficient administration a state where no one was slenderly read or illiterate or untruthful existed in Ayodhya and its provinces with a high level of culture and affluence. Dharma is not yet another 'religious' faith among many mutually contesting 'religious faiths'. But neither is dharma antagonistic to any religious faith. Rather, dharma is the foundation of 'religion' itself. Thus religion in its institutional form divides, while dharma unites. The goal of the king, or of the state, is the protection of all living beings with kindness towards them and that is the highest dharma The Rajdharma of the king (state). Rama further asks Bharat to take good care of the soldiers and servants by timely payment of their salary and supply of provisions. He warns that if these people get angry with the king great disaster comes to the state. Though Ramayana is a Kavya, it also deals with polity, administration, diplomacy and war and other topics. War according to Valmiki, is not to occupy the land or properties of the vanquished but its purpose is to remove an obstruction. Rama did not kill Ravana for occupying Lanka but to remove an impediment in the rule of dharma and that is the righteous war. We shall see later that Mahabharata also deals with the concept of dharma and Rajdharma in its manifold aspects. We have seen that the king or state in Ramayana is to observe certain norms of Maryada, during governance, based on dharma. 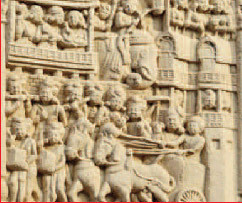 The Mahabharata enquires about the political theory of which law and governance are essential components. There was a time when kingdom or king (state) did not exist and there was; neither governance nor governor. The people protected each other by means of dharma which sustained them. But this state did not last long and after sometime people lost their sense of duty and obligations. Driven only by their greed, people started doing violence to each other which created anarchy. Thus arose the need for a governing force, to bring order in the people and the king or state was invested with the authority of governance or power of danda (punishment). It is through governance order is created and the material conditions of life are protected. Protection is the first foundation of all social order and the justification of the existence of the state. The Mahabharata declares that the power of danda or the authority to govern is drawn from the tenets of dharma. It is, therefore, essential to enquire into the attributes of dharma. Yudhishthira, in Shantiparva, asks whether dharma is knowable or not or whether one knows it or not; it is finer than the razor's edge and also quite solid like a mountain. Sometimes, it appears as crystal clear and when one approaches near it, it just disappears, then how to know it? Mahabharat has tried to resolve this dilemma which even sages found difficult to resolve. A question can be naturally asked as to how dharma was explained in Vedic Texts. According to Vedic understanding, the order in the Universe is sustained by a spiritual law Rta, it was inferred that perhaps order in human affairs would also be sustained by a similar universal law - called as dharma. There have been several meanings of the dharma, including varna-ashrama dharma. According to Mahabharata, dharma can be best understood through its attributes. Before trying to know the attributes of dharma discussed in Mahabharata, one should understand that dharma is not 'religion'. It is wrong to equate dharma with religion in the sense of the terms in which 'religion' and 'religious' have been used in the common parlance. For example, all the sematic religions believe in an extraterritorial creator-God, revealed through a prophet who announces the sacred commandments, recorded in a book, to regulate personal conduct, thought and relationships, and also in a hierarchy of priesthood to supervise and control that regulation. Dharma has none of these elements as any essential part of its meaning. It does not require as a presupposition even 'belief in the existence of God', which all religions do. Thus, Dharma is not yet another 'religious' faith among many mutually contesting 'religious faiths'. But neither is dharma antagonistic to any religious faith. Rather, dharma is the foundation of 'religion' itself. Thus religion in its institutional form divides, while dharma unites. A religion is exclusivist because it rejects all that is not in its book or commandments while dharma is all inclusive, and includes every form of life. In this sense dharma is holistic and takes life and issues in their totality. Since religion is divisive, it must be separated from the affairs of the state and governance, as it has been done in the West. Dharma, on the other, should form the foundation of every socioeconomic thought and praxis, affairs of state and governance for creating a sharing and caring world. Dharma, therefore, cannot be synonymous with any particular social structure because this would be against its universal character. According to Mahabharata, dharma can be understood as what supports, sustains, upholds and brings together all living beings, securing, their dharana and therefore, whatever has the characteristic of doing that, is certainly dharma. And further, All the dharmic preachings are with a view to nurturing, cherishing, providing more amply, enrich, enhance the life and living of all living beings. Therefore, whatever has the characteristic of bringing that about certainly is dharma. The Mahabharata declares in uncertain terms that all pronouncements of dharma are with a view to secure freedom from violence, ahimsa. Therefore, not doing violence against all living beings is the characteristic of dharma. Describing further attribute of dharma, the Mahabharata continues to emphasize that ahimsa is the highest dharma - 'ahimsa paramodharma, ahimsa is the highest truth and together they secure the highest good for all human beings. The state, according to Mahabharata, was created to protect the weak, the poor, the exploited, the helpless, and the oppressed from the strong. That large class of the weak is only able to survive because of the power of the king and this is an important aspect of Rajadharma. Ahimsa is not 'just killing' but it is to create a situation of non-violence in human behaviour and determines the basis of relationship and its fulfillment. Therefore, it is on the basis of ahimsa and truth all actions are governed. Remembering that whatever has its beginning in justice is dharma and whatever is unjust is adharma, it follows that if one dharma is destructive of another dharma, then it is sinful and not dharma. That alone is true dharma that is established without denigrating and opposing another dharma. 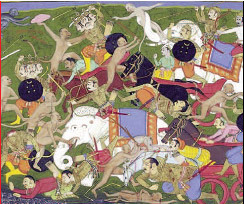 The message from the Mahabharata is loud and clear that all authority in all its acts be subject to dharma, and that dharma is the sovereign and not the king or the state and further, the laws and governance of the state shall never deprive, starve, diminish, separate, uproot, hurt, do violence, debase, and degrade the other. When they do, they become self-destructive in the first place. The natural foundations of law and governance everywhere are in dharma', which is very flow of life in which all are united. As stated earlier, the purpose of governance is to ensure the people 'protection form fear, for there is nothing more degrading to human worth than living in fear.' The Mahabharata then goes on to enquire the limits to use of governance and the legitimacy of opposing it when it creates conditions of oppression and violence. Hence, given the fundamental importance of governance against anarchy, also the fundamental place of the philosophy of governance, 'the raja-dharma', the Mahabharata reiterates again that in all the acts of governance, the goal of the king, or of the state, is the protection of all living beings with kindness towards them and that is the highest dharma The Rajdharma of the king (state). Maharshi Vyas enjoins, therefore, Let the king protect his subjects from their fear of him; from their fear of others; from their fear of each other; and from their fear of things that are not human. The main purpose of the state, according to Mahabharata, is to create conditions for freedom from fear, including the fear of violence. In other words, its purpose lies in 'protecting the small fish from the big fish', keeping in mind that in the process the state does not itself become the 'big fish'. That will lead to oppression and terror resulting in adharma by the state. The king to create social and economic conditions not only of freedom from fear but, more positively, of human flourishing, where the individual is enabled to come into the fullness of his, or her, being. Ahimsa can be realized only in a society where trust, friendship, and caring - the elements of human bonding, individual and social - exist. Protection' has, in the Mahabharata, the wider meaning of creating conditions of personal and social bonding. That is the function of the king, or of the state. The state according to Mahabharata, was created to protect the weak, the poor, the exploited, the helpless, and the oppressed from the strong. That large class of the weak is only able to survive because of the power of the king and this is an important aspect of Rajadharma. The Mahabharata further warns the king, 'Beware, the weak are, in actual fact, much stronger than the strong, for nothing is left of the strong that have been burnt by the weak'. And further, "When the king wipes the tears of the poor, the dispossessed, and the old. And creates happiness among the people thereby, such conduct on his part is called the king's dharma (Rajdharma)." According to Mahabharata, Law and governance are the instruments for protection. The importance and meaning of protection requires a set of laws and governance which create social and economic conditions where one lives in a society without fear. Thus, there is a wider meaning of protection and the Mahabharata enjoins upon the king to create social and economic conditions not only of freedom from fear but, more positively, of human flourishing, where the individual is enabled to come into the fullness of his, or her, being. Ahimsa can be realized only in a society where trust, friendship, and caring - the elements of human bonding, individual and social - exist. Protection' has, in the Mahabharata, the wider meaning of creating conditions of personal and social bonding. That is the function of the king, or of the state. In Mahabharata principles of governance require the state to be committed to social concerns which need to be attended for creating an ahimsak society. The institutions of the state have to be continuously vigilant for keeping order and curbing violence. 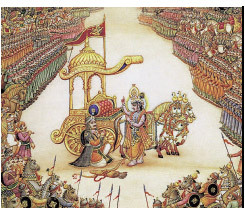 The discipline of the king is to be derived from the purpose for which he was invested with the power of governance, and Mahabharata asks the king (state) to exercise power subject to certain disciplines. The king should first discipline himself and then only try to discipline his subjects and subordinates. If he does so without realizing his own defects, he becomes an object of ridicule and should always remember that The interest of his subjects alone is his interest, their well-being his well-being; and in their good lies his own good. The Mahabharata says that power is never considered its own justification, for the state is not an end in itself and further, the power without dharma is as much the way to tyranny as dharma left unprotected is the way to anarchy. In other words, the power 'of the state has to exercise disciplines upon itself most of all, the discipline of dharma. 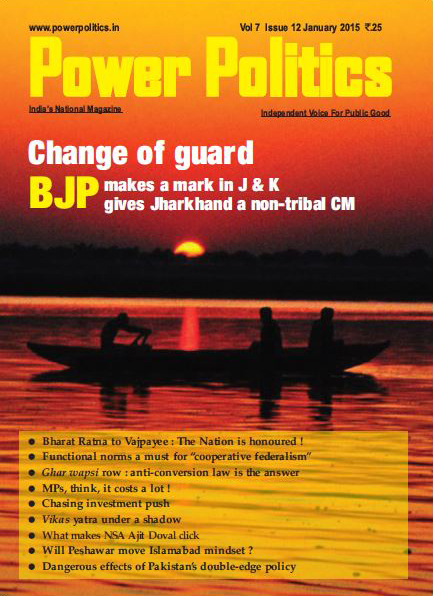 Power is not to be exercised arbitrarily but in accordance with the dharma' exhorts Mahabharata. The Apastamba Dharamasutra proclaims with such finality, it is the primary duty of the king to ensure that none within his domain suffers from hunger, want or deprivation. Sage Apastamba lays down the discipline of the kings in this context, thus: let no one suffer from hunger and disease, or from extremes of heat and cold. No one in the kingdom ought to suffer thus, either because of general scarcity or because of specific design against him. Under such circumstances, people may become angry and the state might be lost to the enemies of the country. 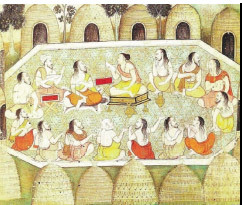 And, Bhisma, in a particularly intense yet short chapter in the Anusasanaparvan, warns Yudhisthira that the hunger of even one person in a kingdom renders the life of the king meaningless; and if there be a king in whose kingdom young children eagerly watch the delicious meals of others and are not offered the same food with all ceremony and care, what indeed would be the fate of such a king? What indeed can be a sin greater than that. The king must protect the wealth of the old, the young, the blind and the poor. And he must not take away anything from the helpless women, or from the cultivators who have created their own irrigation system. The wealth that is taken away from the poor takes away the prosperity of the king and destroys the country. Therefore, instead of depriving the poor, offer them great comfort and gratification, and relieve the people of all fear of hunger. And further, the king should not extinguish the opportunities of livelihood. The protection of the life and dignity of women is the primary aim of governance and the Mahabharata in unequivocal terms states, 'A king in whose kingdom crying and wailing women are forcibly carried away in front of their sons and husbands who cry and wail in vain, one feels that there is no governance. And Bhisma adds, having given his promise to protect the people and the state fails to protect then such a state is as good as non-existent. 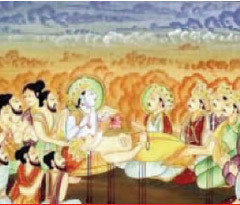 If there is a situation which suddenly leads towards chaos and anarchy and the very existence of the state is in danger and it is no longer able to preserve and protect dharma, Mahabharata, under the circumstances allows the state to waive the normal ethical behaviour, only and only, till the duration such circumstances exist. This is known as conduct during distress - Apadh-Dharma. The state can take measures, though unethical, for collecting resources by force or even coercion. The Mahabharata says if the state exists then alone dharma can be protected and order can be restored when the very existence of the state becomes doubtful, the material resources required to counter the threat have to be collected. The protection of the life and dignity of women is the primary aim of governance and Mahabharata in unequivocal terms states, 'A king in whose kingdom crying and wailing women are forcibly carried away in front of their sons and husbands who cry and wail in vain, one feels that there is no governance. And Bhisma adds, having given his promise to protect the people and the state fails to protect then such a state is as good as non-existent. But the king is also warned that anything acquired by adharma ultimately leads to resentment and anger leading to violence in the society. Resources acquired by unethical means would never prove beneficial to the state and the people. In times distress, it is the duty of both the state and the people to protect each other. Therefore, as soon as normalcy is restored the state should return back to the people whatever was acquired to save the existence of the state. Mahabharat warns that distressful times should not become an excuse for doing wrong things. Perhaps for the first time anywhere, it is in the Mahabharata that an argument against capital punishment was advanced. 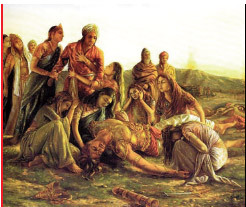 It develops in answering the question of Yudhishthira, put to Bhishma: 'How should the king protect the people in a way without causing violence to anybody? 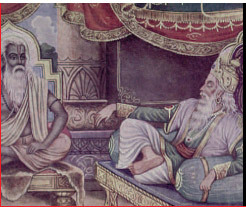 Bhishma narrates an old conversation between Satyavan and his father, Dhyumatsena who says, 'One should use only that system of punishment that does not dismember the body. Neither should anybody be punished without first carefully examining the alleged offence of a person and applying to it the established principles of law.' On putting a criminal to death, the king renders his family without any means of sustenance, which is like putting them to death as well. Therefore, the king must think carefully. The purpose of governance is not to kill the wicked, but to create conditions in which the people can be good. One should use only that system of punishment that does not dismember the body. Neither should anybody be punished without first carefully examining the alleged offence of a person and applying to it the established principles of law. The Mahabharata continues to stress that the power of governance must be exercised without anger and intolerance, the king must keep away from darpa (arrogance) and should be free from deviousness and cunning. The king should also be free from likes and dislikes. He should keep preferences, anger, greed and vanity far away and treat all beings with a sense of equality. Because the king holds power he is not authorized to oppress people and violate dharma. The king is placed more than anyone else under the fear of danda, law and governance. On putting a criminal to death, the king renders his family without any means of sustenance, which is like putting them to death as well. Therefore, the king must think carefully. The purpose of governance is not to kill the wicked, but to create conditions in which the people can be good. The Mahabharata has narrated a story of a frightfully terrible war and its resultant consequences on either side and declares that nothing worthwhile has ever been achieved through war. The king should preserve and expand whatever he (state) possesses without recourse to war. Victories must be achieved by enhancing all areas of knowledge and not by cunningness and arrogance. In other words, Mahabharata proposes reconciliation as a process for resolving the two opposite view points. The crux of the foundation of governance is dharma based on truth and ahimsa. In other words, the state should also be accessible and transparent. The assembly or the sabha, that declares whether a law or an order is in accordance with the Dharma must have the trust of the people. 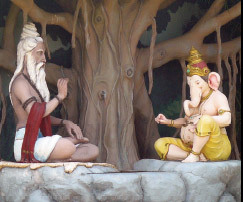 Mahabharata prescribes that, 'An assembly without elders is no assembly. The elders who don't speak according to dharma are no elders. Dharma not based on truth is adharma. Finally truth full of cunning is no truth. 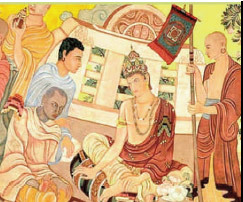 Kautiltya's Arthashastra is a unique Indian text that hasn't lost its relevance in contemporary India. The very reason that this book appeals to our generation, even after over 2400 years, shows that Kautilya has fine-tuned each concept in great detail, proving his farsightedness. 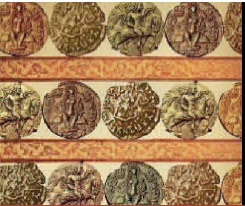 Kautilya says that treasury (Vittam) is the foundation of the state but vittam or finances have to be collected in accordance with dharma. 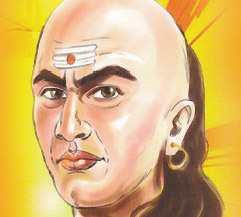 A king, says Kautilya, should devote his best attention to the treasury. 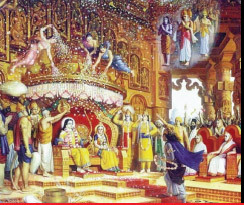 Thus he, like the Mahabharata, advocates that dharma is the basic in the affairs of the state, the Atharshastra exhorts the king to behave in a righteous manner and further says," In the happiness of the people lies his happiness, in their welfare, his welfare." Kautilya defines the purpose of the state as one - ensuring the welfare and security of the people and two - maintaining and expanding the power of state. Although, Kautilya expounds dharma as the basis of governance but when it comes to international affairs, he says the biggest dharma is the protection of state. This is not a contradiction, according to Kautilya, because if the state is not protected from external aggression how can dharma be practiced? Kautilya agrees with the Mahabharata about using unethical methods during threat to state and suggests coercion is necessary even on its own people because some times the state might face both internal disorder and external threats simultaneously. 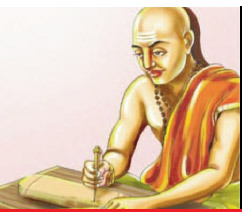 Kautilya says, the pursuit of people's welfare as well as the maintenance of the philosophic tradition, the Vedas and the economic well-being of the society are dependent on the power of punishment danda wielded by the king. The maintenance of law and order by use of punishment is the science of government. By maintaining order, the king can preserve what he already has, acquire new possessions, augment his wealth and power, and share the benefits of improvement with those who are needy or who can use them for the benefit of the people. The progress of this world depends on the maintenance of order through the fear of danda (punishment). Some authors, other then Kautilya, have commented: 'Those who seek to maintain order shall always hold ready the threat of punishment. For, there is no better instrument of control than coercion.' Which the empowered agencies can always use for personal benefit ignoring the interest of the state. Kautilya disagrees because a severe king, meting out unjust punishment, is hated by the people he terrorizes while one who is too lenient is held in contempt by his own people. Whoever imposes just and deserved punishment is respected and honoured. A well-considered and just punishment makes the people devoted to dharma, artha and kama (righteousness, wealth and enjoyment). Unjust punishment, whether awarded in greed, anger or ignorance, excites the fury of even those who have renounced all worldly attachments like forest recluses and ascetics, not to speak of householders. Duties common to all, ahimsa (not-violence to be observed in relation to all living beings), satya (truthfulness), compassion, freedom from malice, tolerance and purity (physical, intellectual and mental in all aspects of one's persona). He also suggested various measures for the king to adopt to improve the ethical climate, and to this end proclaimed, a king should uphold the highest ethical standards and rule through his character and qualities and not by his authority, a rigorous ethical code of conduct was to be observed by the king and his staff. law, the weak can resist the powerful. Kautilya pleads for a just and fair legal system capable of protecting the poor from the tyranny of the powerful, including the state. It is interesting to note that Arthashastra holds the state as responsible for any failure to protect the public. "If a stolen property was not recovered and the thief could not be apprehended, the victim was compensated by the state. If the state unjustly appropriated the property of any person and did not restore it back, the owner was paid its actual value and if the state was found responsible for not protecting a person and thereby increasing the risk of loss, the judges could increase the compensation." Kautilya, thus, advocates the principle of responsibility and accountability of the state in its acts and administration. That an idea like this was conceived by ancient Indian political thinkers in the 4th century BC is something remarkable. A responsive and accountable state with governance based on the foundation of dharma would perhaps be cherished by all. According to Arthashastra, the stable social structure and prospering economic environment is dependent on governance that ensures order and sustained prosperity. Kautilya, therefore, emphasized the creation of an ethical climate in the state and also suggested various measures to enhance it. He described the basic dharmic values as, "Duties common to all, ahimsa (not-violence to be observed in relation to all living beings), satya (truthfulness), compassion, freedom from malice, tolerance and purity (physical, intellectual and mental in all aspects of one's persona). He also suggested various measures for the king to adopt to improve the ethical climate, and to this end proclaimed, a king should uphold the highest ethical standards and rule through his character and qualities and not by his authority, a rigorous ethical code of conduct was to be observed by the king and his staff. Excessive use of the state's coercive power, warns Kautilya, leads to resentment, unrest and rebellion among the people, while the impotent state leads to anarchy. He argues that a central task of the state is to identify grievances of the people and their causes, preferably before resentment among the people turns into unrest or rebellious mood. Without delay, the ruler must remedy the causes of such grievances in order to calm down the people. The emphasis should be on the preventive measures, and even if, in spite of remedial action, a rebellion does break out, the people should not be punished collectively. Instead, they should be treated leniently. If they refuse to compromise or submission, harsh measures be used to curb the menace. For providing good governance, Arthashastra recommends that the state apparatus should be well organized and efficient. A king can create such a situation only with the help of others. Just as one wheel alone can not move a chariot, the king as a single person can not run he state, therefore, the king should appoint advisers, counselors and ministers to advise and help him. Kautilya says that a brave and righteous king, advised by the learned and the wise who know the shastras supported by a loyal and devoted team who are ever vigilant to keep the treasury full, can never be defeated. The Arthashastra them goes on to discuss the number, qualities and method of selection of the top echelons of king's administrative hierarchy. Kautilya recommends for creating a strong intelligence system to keep a watch on internal conspiracies and external threats to the state. Like the Mahabharata, Kautilya also argues in favour of reconciliation as a process for resolving the contradictions. For this, establishment of a credible mechanism and an inclusive governance with firm commitment to the welfare of the weak and poor was also recognized by both Mahabharata and Arthashastra. For providing good governance, Arthashastra recommends that the state apparatus should be well organized and efficient. A king can create such a situation only with the help of others. Just as one wheel alone cannot move a chariot, the king as a single person cannot run he state. Therefore, the king should appoint advisers, counselors and ministers to advise and help him. Kautilya says that a brave and righteous king, advised by the learned and the wise who know the shastras supported by a loyal and devoted team who are ever vigilant to keep the treasury full, can never be defeated. The Arthashastra then goes on to discuss the number, qualities and method of selection of the top echelons of king's administrative hierarchy. Kautilya recommends for creating a strong intelligence system to keep a watch on internal conspiracies and external threats to the state. The Kautilyan state assumes social responsibility not only for the people, but also for animals. The state was running the hospitals, gurukuls and enforced the rules of public hygiene. The state looked after the women's rights including divorce and remarriage of the widows. The government kept food reserves for emergency situation. Agriculture being the principal source of revenue was given all support. The artisans smiths etc. received full and sympathetic consideration by the state. 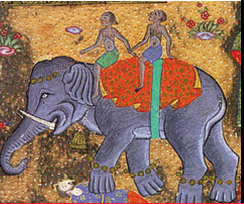 Elaborate arrangements were made for animal welfare perhaps a unique feature of Arthashastra. State had also taken special care for consumer protection. Weights and measures were standardized and legal system to prevent cheating the consumers and foreign traders were enacted. In matters of grievance redressal, by government or judiciary, priority was given to the deprived, the poor, the widows, the disabled, the learned and so on. Even at such a distant past the farsighted Kautilya had emphasized that the total salary bill of the state was to be capped at about one fourth of the revenue collected. In some sectors like textile, the wages were linked with the quality (or productivity) of the product. Wages were to be disbursed promptly and in case of soldiers delay in payment of salaries was not acceptable in any circumstance. Officers were not permitted to misbehave with the women with whom he had to deal officially, violation of this code was punishable. Thus, one can see Kautilya was far ahead from his times. "One also finds a continuity in the evolution of the political thought starting from Vedic era to Kautilya. The dharma as the foundation of governance has been recognized all through and the emphasis on social welfare and personal character of the king has been maintained throughout this period of Indian history. Let us stop calling Kautilya as India's Machiavelli while the facts are other way round. The author is a scholar of international repute and an eminent parliamentarian.